Juniper Thyme is a pungent small sub shrub that grows about six inches tall and blooms profusely. It silvery rigid needles also give it the name Moonlight Thyme. Cut flowers off after bloom to keep it tidy. 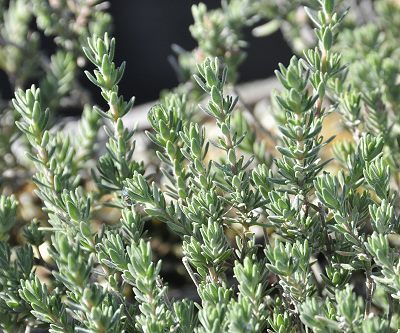 Culinary Thymes, like Juniper Thyme, are small which make them perfect candidates for growing in a container. This plant is often available in plug trays. These trays hold 128 of all the same plant. They are a great low cost way to fill a lot of space. Each cell is 3/4 of inch by an inch. Check here to see if Juniper Thyme Plug Trays are available.